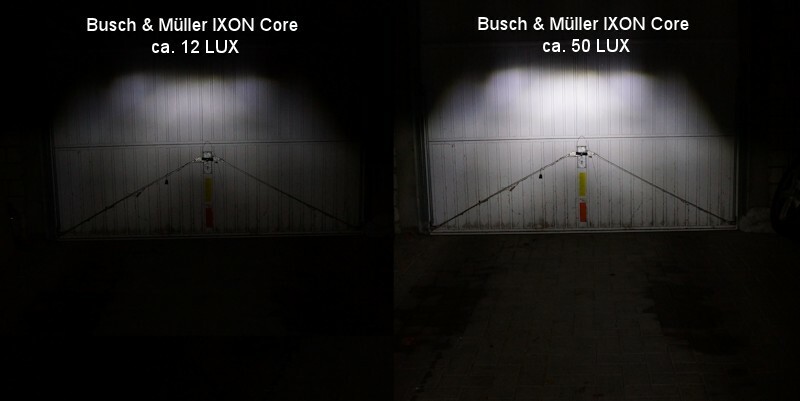 Busch & Müller is a high-quality brand Made in Germany, today we look at the battery bicycle lamps » Busch & Müller IXON Core » and » IXXI » in more detail. In test in Bike magazine is given to the handling of the cultivation, the luminous efficiency, the battery performance and weight. Ordered we have a light set consisting of the IXON Core and the taillight IXXI incl. Mount, charger and everything you need of accessories for our Busch & Müller IXON Core Test. Are supplied the two lamps in a commercial package. Included with the two lamps, the holders and a USB cable are included to charge the lamps. The feel and the processing of the bicycle lamp look solid. Despite its low weight, it has a high quality feel while holding the bicycle headlamp. 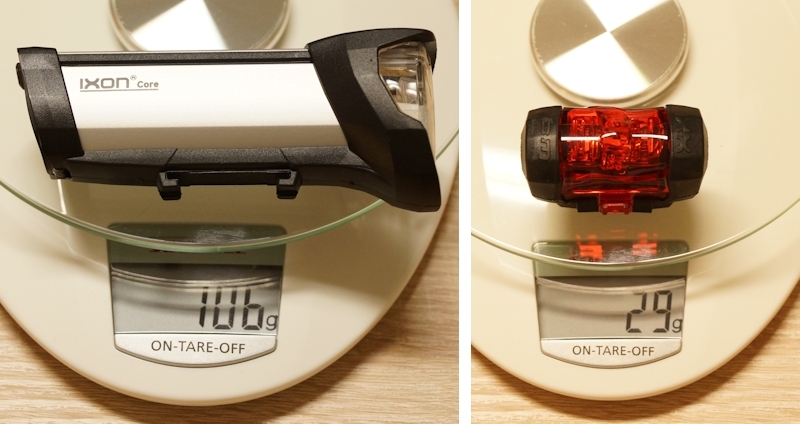 With only 106 g the front headlights and 29 g for the rear light, these two bicycle lamps can quite impressive. Of course, the low weight is noticeable in the battery capacity. So that we can take advantage of the bicycle lamp also, it must be mounted or on bicycle. We can do this our bike in a repair stand clamp and provide us as a firm grip for growing. We remove the bracket and looking us a free and appropriate position on the handlebar. When mounting a tool-free assembly is not a problem. To mount only one screw is required which can tighten with your fingers. The holder itself is a terminal structure to which the lamp is pushed on it later. The installation took only a few seconds in our test and is easy to create even for laymen. The cradle for the Busch & Müller IXXI taillight of manufacturers is more easily approached the matter, probably possible to easily? The backlight itself has two plastic hooks which serve as support. This will output a rubber band / an elastic band is placed around the saddle able and hooked on each side of the back of people. Even the lamp is mounted. A disadvantage of this assembly, one would like to invite the lamp, so you always have to remove the whole IXXI taillight. Switching from Busch & Müller IXON Core bicycle headlights is easy to only the button at the top must be pressed briefly. With this one button you can switch back and forth between the different stages. Light of the button blue, one operates the bicycle lamp with 50 LUX (high power mode), the button lights up red, the headlights with approx.12 LUX (Low Power mode) is operated. The power button is also the status indicator for the battery status LED bicycle lamp. With a blink every 2 minutes to one of the status of the internal battery is signaled. Sinks the battery charging status, the lamp automatically switches from high power mode to the low power mode. Of particular interest, the law is prescribed Mindestluxzahl below 10 LUX, the indicator light flashes red / blue , now it says Take a break and recharge the battery. In the burn time we do not only rely on the manufacturer’s specifications and check for yourself once after. In our experiment, the Busch and Müller IXON Core has persevered with a full battery just 4.5 hours. Fully charged, the battery is to just under 3 hours, so it promises Busch and Müller in the user manual for bicycle lights . When LED taillight IXXI battery charge status is displayed with a very small, almost be overlooked, green LED below the main red LED. If this is lit green, everything is ok.Turns off the green LED, so a pause must be inserted and the rear light are loaded here. Both battery lamps are equipped with an automatic shut-off, so the battery is protected against deep discharge. With approximately 50 LUX, the bicycle LED headlight can quite impressive. As can be seen well in the picture, it also illuminates the road in front of the bike enough with out. but turns the lamp on approximately 12 LUX down, it is already bleak on the bike paths. A risk-free cycling in unlit forests, roads or lanes is no longer possible. 12 LUX is just not enough to be sufficient to provide a bicycle. These two bicycle lamps are extremely lightweight and are therefore ideal for anyone who pays attention to the driving weight. With 50 LUX on the chest, the headlights can be quite impressive. The low weight is of course the relatively small battery. Here one has in Busch and Müller a good compromise between weight and burn time found. 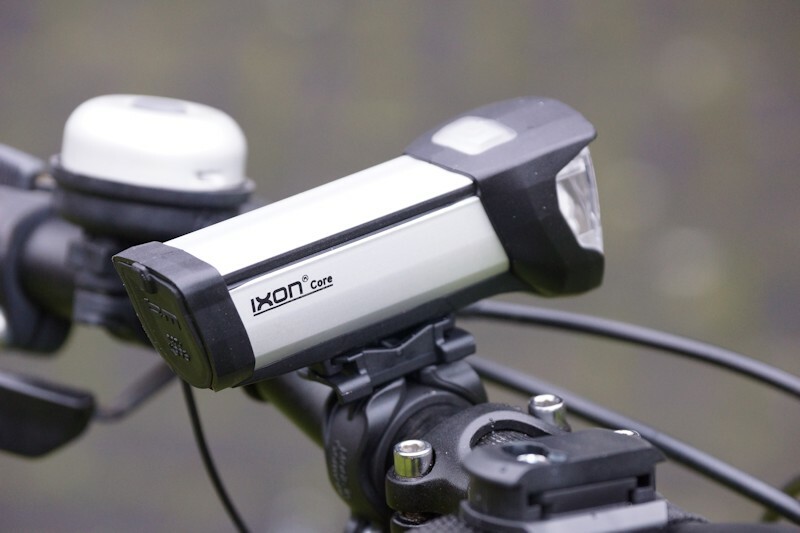 The operational area of the bicycle headlights would we apply to the racing area (due to the weight), MTB area and in the city at short distances. Who only 5-10 minutes to work has, which is the frequency of charging cycles will not notice so quickly. on the other hand some getting used to is the holder for the IXXI taillight, here is the product developer at B & M should prefer to a fixed mount some of which you can remove the reflector.